The premium mid-range segment is a hotly contested section of the market currently dominated by the OnePlus 3T, which offers high end specification and features at an incredibly competitive price. The Samsung Galaxy A7 (2017) is undoubtedly the best looking mid-range smartphone the company has ever released. It is nice to see Samsung getting serious in terms of design about other smartphones in their lineup apart from the flagship S and Note series. While the competition comes with better specifications, the Galaxy A7 aims to differentiate itself from the rest on the virtue of its design prowess. The Galaxy A7 comes with an all metal mid-frame sandwiched between 2 layers of glass - 3D curved glass on the back and 2.5D glass on the front. While this makes the device look incredibly sleek, it comes with its own set of cons as well. Not only does it make the device incredibly slippery and a fingerprint magnet, it also makes it fragile and prone to breaking easily. On a positive note, the 3D curved glass at the back not only looks striking, it also helps make the A7 a delight to hold in the hand. Additionally, unlike many smartphones out there, the camera does not protrude out which helps give the smartphone a very uniform and seamless look. 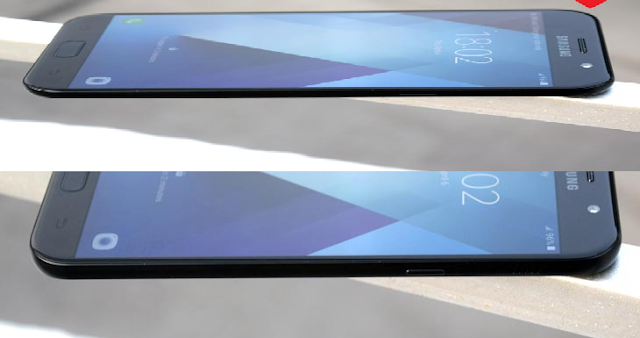 The inspiration behind the smartphone's design is Samsung's 2016 flagship - the Galaxy S7. Considering the fact that the Galaxy S7 was and still is one of the best looking smartphones out there, that's not a bad design choice by any means. In fact, the Galaxy A7 looks so similar to the S7 that it can be easily called the Galaxy S7's doppelganger. Coming to the sides of the smartphone, the volume buttons are located on the left edge, while the single loudspeaker and the power button are located on the right hand side. While the single side-mounted speaker is loud and clear, stereo speakers are sorely missed. The placement is also very un-ergonomic - the speaker gets easily blocked with one's hand whilst watching videos or playing games in landscape mode. Underneath the display, the Galaxy A7 comes with a physical home button flanked by two capacitive keys for multitasking and back. The fingerprint sensor is embedded into the home button and is a big disappointment. It is one of the slowest fingerprint scanners I have used in a while and is also not very accurate. I experienced a lot of misreads and errors whilst using the device as my daily driver. 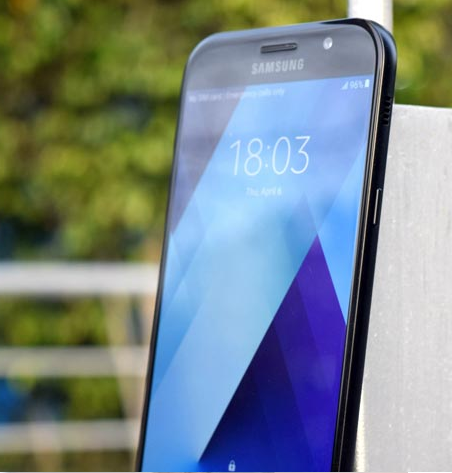 The Galaxy A7 on runs on Samsung's TouchWiz UI running atop Android 6.0.1 Marshmallow. The lack of Nougat out of the box in 2017 is extremely disappointing to put it mildly. While the iteration of TouchWiz on the A7 - which borrows features from the ill-fated Note 7's Grace UX - is a major improvement over past versions and is much lighter and faster, it still looks and feels very different to stock Android. TouchWiz is still pretty heavy and full of bloat. What is rather disappointing is the fact that the software feels laggy and a little slow. This can be pinned down to the multitude of animations Samsung has stuffed in TouchWiz, whose charm fades off after a while and they just become a rather unneeded source of delay. With a launcher like Google Home installed, things become much better. Here's hoping things get better with the Nougat update, which the company has promised is coming soon. Another rather infuriating aspect of TouchWiz is the amount of bloat on board. The situation is so ridiculous that the A7 out of the box comes with three web browsers - Samsung's own, Opera Max and Google Chrome, 2 photo apps, 2 music apps and so on. What complicates matters even further is Samsung's deal with Microsoft to bundle their suite of applications on every Galaxy phone. So out of the box, the Galaxy A7 comes with the full suite of Google apps, Microsoft apps and Samsung's own apps. What makes matters even worse is that almost all of these apps cannot be uninstalled, only disabled. The Galaxy A7 comes with support for a multitude of gestures - some genuinely useful and some gimmicky. In fact, the amount of software features on-board is so exhaustive that it can become a little intimidating at first. Let's talk about the useful gestures first - You can quickly launch the camera by double pressing the home button, you can mute an incoming call by turning the device over or by placing your hand on the screen and you can place a call directly by bringing the smartphone over to your ear when a contact's details are on the screen. The gimmicky gestures include a weird one in which you have to drag the edge of your hand across the screen in order to take a screenshot and also one where you can view an app in pop-up view by swiping downwards diagonally from either corner at the top of the screen which almost always just brings up the notification shade. There are some other useful features on board too. After capturing a screenshot, the smartphone gives you options to either extend the screenshot or edit the screenshot. There is also a one-handed mode, a secure folder in which you can put applications and lock/unlock it with your fingerprint and a way to manage useful features while playing games. Samsung's multi-window mode and floating window mode are also on board to enhance multi-tasking. 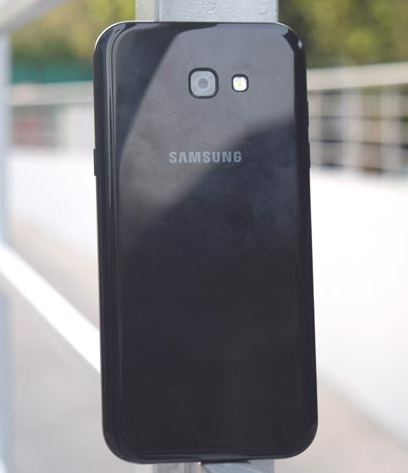 The Galaxy A7 comes with a 16MP rear camera with an aperture of f/1.9, autofocus and an LED flash. On the front, there is a 16MP camera as well with an aperture of f/1.9. The camera is quite a capable performer in well lit situations. Images produced are crisp and vibrant with natural colors and a surprising amount of detail. When it comes to low light, the performance dips quite a bit. While the images are fairly decent and usable, there is a fair bit of graininess and noise that creeps in. Video capture is limited to 1080p and is a pretty standard affair. While the level of detail, color reproduction and saturation is good, the lack of OIS is sorely felt. Additionally, not having 4K video recording in a smartphone that costs north of Rs 30,000 is fairly disappointing.The 16MP front camera on the other hand is a different story. It is much improved from the A7 (2016) and is in many ways superior to the 5MP front camera found in the A7's more expensive sibling - the Galaxy S7. Images produced in good lighting conditions are crisp, vivid and full of detail. Low light performance is also decent, and above average. The Galaxy A7, while not offering the best specifications for the price, offers a very well rounded package overall with IP68 water and dust resistance, a great display, decent battery life, sleek and svelte looks and a premium build. Add to that the fact that unlike many of its competitors, it is available offline and comes with a trusted brand's after sales support and you have a device that can hold its own against its competitors. What goes against the smartphone are the under-powered internals. If the smartphone had more powerful hardware inside, it would have been virtually unbeatable in this price point as it comes with many features which competition like the OnePlus 3T lack. For those who value performance over everything else, the Galaxy A7 is not a good bet. They would be better of getting the OnePlus 3T or the Huawei Honor 8, which come with better hardware inside. But for those who value features like expandable storage, water resistance and are a little apprehensive of buying smartphones online, the Galaxy A7 is a solid buy which will give little cause to complain. The fact that it looks stunning with its glass and metal body is an added bonus. Samsung Galaxy A7 2017 review: Ticks almost all the right boxes The premium mid-range segment is a hotly contested section of the market currently dominated by the OnePlus 3T, which offers high end specification and features at an incredibly competitive price.